Back to school time is upon us and for children that means it’s time to saddle up and head to the local bike rodeo. An event like this can remind young cyclists that safety and fun should go hand in hand when they ride around their neighborhood. A bicycle rodeo is also an easy way to promote physical activity and engage the community in cycling. 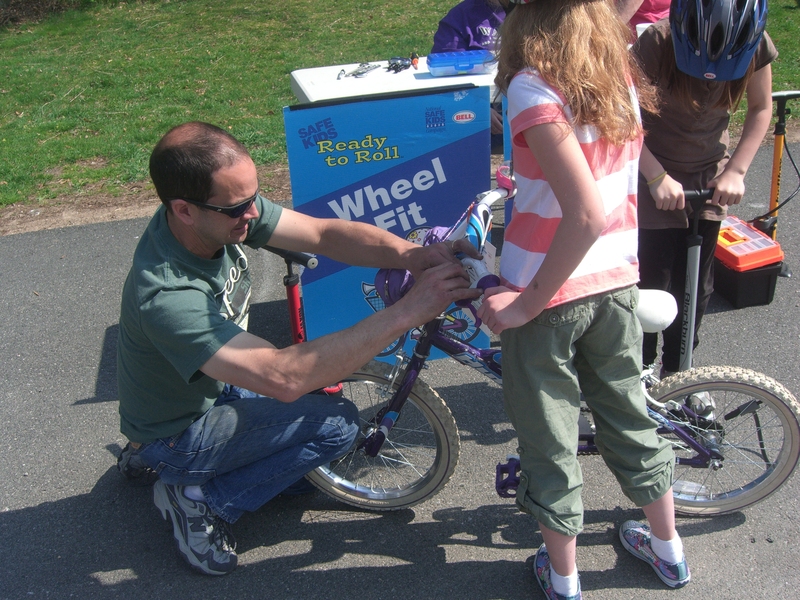 According to KJ Feury of New Jersey SAFE KIDS, “Bike rodeos are important because they remind kids and parents of the simple ways to ride smart and keep their bike maintenance up to speed.” Here are some things to keep in mind if you are planning one of these enjoyable and educational cycling events. The bike rodeo is traditionally intended for schoolchildren from kindergarten to middle school. With a potentially wide age range, you may want to consider offering activities that are tailored to specific age groups. Young children who are just learning to ride will need a much different focus thanolder students who may already use their bikes as a regular means of transportation. Where should we hold the rodeo? Bike rodeos need a fairly large amount of open space since children will be riding their bicycles at and around multiple stations. Don’t let the prospect of locating space be daunting; there are many pre-existing facilities that work well for a bike rodeo. A parking lot at a playground, commercial building or school is ideal. Local officials may even be able to close off a street for a few hours. If weather is an issue, a gymnasium can provide space for an indoor event. Bike rodeos are usually organized by stations, with participants moving through each station along a course marked by cones or chalk. The purpose of stations is to provide children with a variety of activities to learn and practice their skills and to move them efficiently from one lesson to the next. The activities at these stations can be broadly categorized by check/tune-up stations and skills stations. Check- or tune-up stations will be one of the first stations bike rodeo participants visit. Here, trained volunteers and/or bicycle mechanic(s) will examine bikes for common maintenance issues (i.e. poor fit, deflated tires, worn chains, disabled brakes). Mark Engle, a mechanic from Marty’s Reliable Bicycle, has worked several events and says “a lot of kids come in with similar problems associated with wear and tear on their bikes, so getting the bikes through the check station is usually one of the most important stations.” By identifying and correcting these problems, these checks may help serve as a wake-up call for parents who may be unaware of a bicycle’s maintenance needs. Helmet fitting is another important check station. 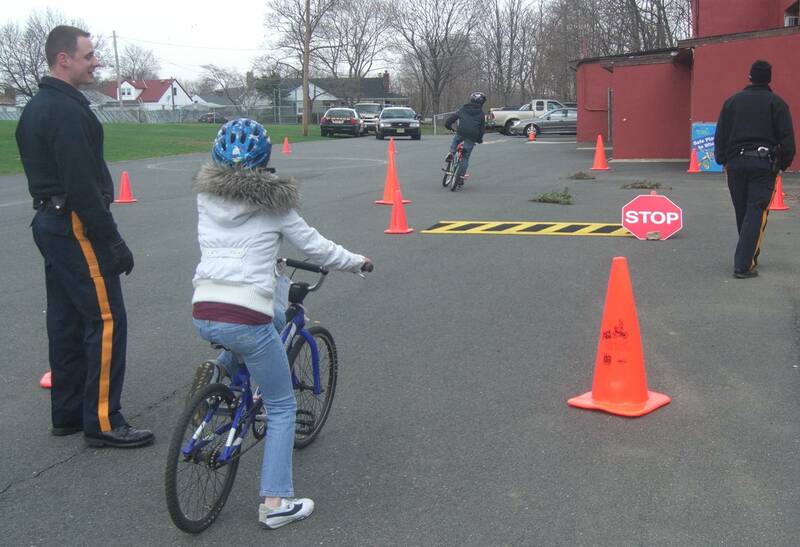 Many children do not wear a helmet even though they are legally required to do so in New Jersey until they are 18. Those that do wear helmets often do not wear them properly and thus will not be protected if they are involved in a crash. By using trained volunteers to properly inspect and fit helmets, you can ensure that each child who attends your rodeo will leave wearing their helmet the right way. You should make an effort to have parents watch the demonstration at the fitting station so that they understand 1) how to fit their child’s helmet at home and 2) the importance of wearing it each and every time they ride their bike. The real fun in a bicycle rodeo begins with the on-bike drills. Many bike rodeos include stations on starting and stopping, important skills that people often overlook, thinking that children will “just figure it out”. Most rodeos also focus on maneuvering and hand signal exercises which develop a cyclist’s coordination and balance as they ride through and around strategically placed obstacles such as cones. Additional options include drills on making tight or sudden turns and more advanced skills such as scanning. Skill stations are only limited by your creativity and the amount of space you have to work with when setting up your bike rodeo. In addition to stations, you should set up a table full of healthy refreshments to encourage participation and keep participants hydrated. Prizes and informative giveaways can provide children with an incentive to put forth their best effort during the rodeo and remind them about what they have learned after the event has ended. Who will help make this happen? Between station props and giveaways, a bike rodeo can necessitate a decent amount of resources. Securing sponsorships and funding for a bike rodeo is a worthwhile investment of time that can greatly enhance the overall quality of your event. For example, with adequate funding, many bike rodeos are able to provide free helmets to all participants or at least to those who do not own one. Funding in the form of local sponsorships can also bring more attractive giveaways to the bike rodeo, such as reflective stickers, water bottles, sports equipment, or business coupons. 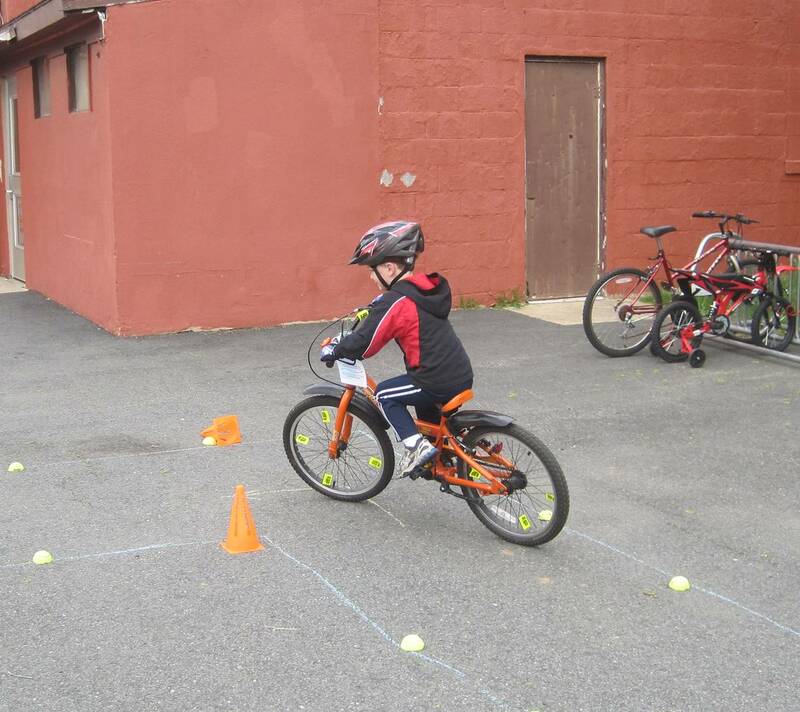 Many local and national non-profit groups support bicycle rodeos, including local SafeKids Coalitions, the Brain Injury Association of New Jersey and YMCAs. Other local groups and clubs like DARE (Drug Abuse Resistance Education), SADD (Students Against Destructive Decisions), Police Athletic Leagues and service clubs like Rotary, Elks, Masons, Lions, American Legion, etc. can also be helpful by providing small donations and engaging volunteers. The more help on hand, the better! A bike rodeo is a community-wide effort, and a diverse array of volunteers will help to promote cycling throughout the neighborhood. Among those you may want to contact are local police officers (some areas even have police bike patrols), bicycle shop owners, school administration and faculty, parent teacher organizations, environmental groups and green teams, and bicycle clubs or outdoor organizations. The best way to advertise is to work with local schools to distribute promotional materials to parents via handouts and email. Posting flyers at popular public locations, particularly at areas with many children (i.e. libraries and schools), is also a good plan for promoting your event. Local media outlets can also play a role in attracting participants, volunteers and sponsors. Contact your local newspaper, television station, or radio station to announce the event on air. Seek out corporate sponsors: ideal partners for bike rodeos include local bike shops (can assist with bike tune-ups), local grocery stores and warehouse clubs (can provide food and beverages), and sporting goods stores. Bike helmets can be purchased in bulk and acquired at discounted prices. Give recognition where it’s due: Be sure to send out a “Thank You” to all volunteers for their efforts. Make sure donations of products and services are recognized in promotional literature and handouts. Start planning early: Even after a location, date and rain date is settled, there are many logistics that will take time including finding volunteers and coordinating donations. While the old adage says that riding a bike is something you never forget—safe riding is an ongoing learning process. It’s important to remember that regardless of which skills are taught or how many drill stations are included in your program, it is not realistic to assume that a few hours at a bike rodeo will teach children all they need to know A one-day event is no substitute for continuous education, but a bicycle rodeo is a great opportunity to acquaint or reacquaint children and their parents with the rules of the road and to help them brush up on their riding skills.